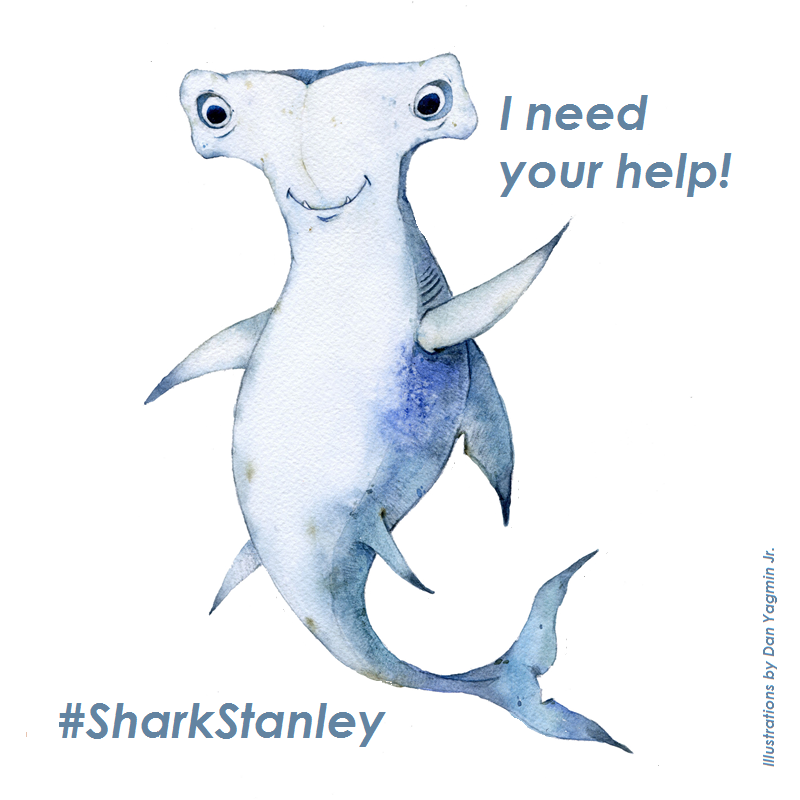 The Shark Stanley campaign began on November 20, 2012 with little more than a name, an idea, and a handful of very determined people. 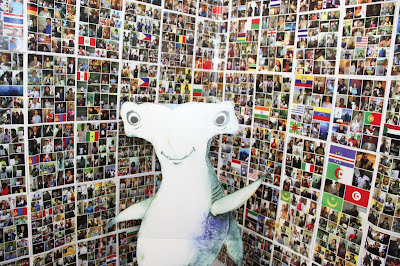 After about a month of discussing how we could engage the world to advocate for shark and manta ray protections at the then-upcoming Convention on the International Trade in Endangered Species of Wild Fauna and Flora (CITES), we settled on something that was a hybrid of the Flat Stanley Project, Ecology Action Center’s Hector the Blue Shark, and those Star Wars mosaic posters popular in the 1990s. The campaign was to be a collaboration between Yale graduate students, the Pew Charitable Trusts, and anyone else who wanted to help. Because students Leah Meth and Onon Bayasgalan were going to head the campaign and be its public face, we decided our target audience would be no less than the youth of the world. This is the best photo I could find of Onon, Angelo, and Leah. Sorry, Onon. There is no shortage of shark petitions on the Internet. We didn’t want to replicate anything that was already out there, so we immediately threw away any notion of doing a signature petition. 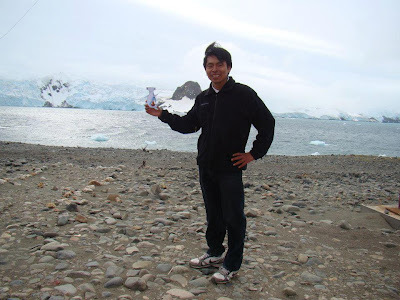 Pew had conducted a successful campaign a few years back on penguins where they asked people to submit photos of themselves, which were turned into a collage of a penguin (i.e. like the Yoda mosaics). However, we couldn’t just do a single collage because CITES has 178 members and each country gets a vote. We needed to reach out to each of the country delegates individually. The idea of a children’s educational package was also raised. We wanted to do more than just gather signatures; we wanted to actively engage young people and create a dedicated army of activists. Out of this discussion arose the idea of Shark Stanley. 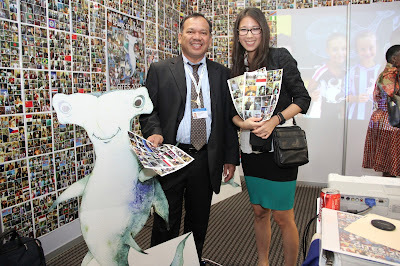 We would have a character that was attached to a children’s activity book that people would take photos with that we promised to deliver in a creative manner directly to CITES delegates at the 16th Convention of the Parties (CoP) being held in Bangkok, Thailand on March 3-14, 2013. 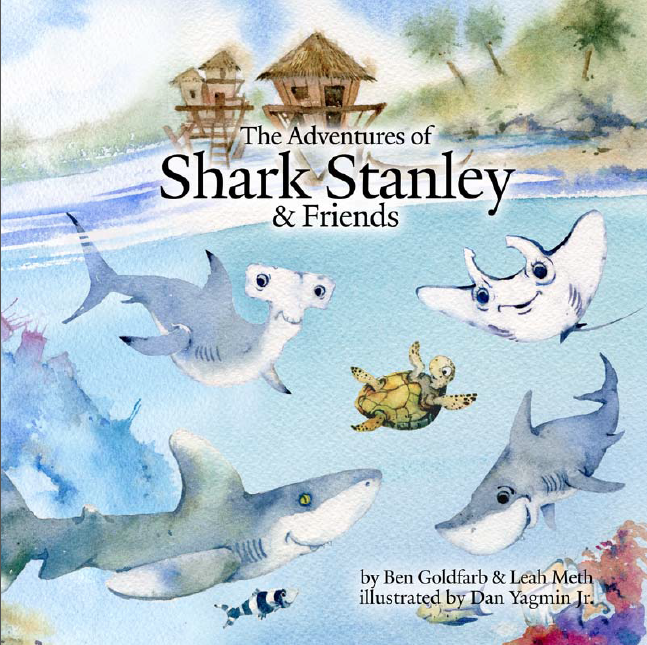 We immediately set to work finding an artist to create Shark Stanley and commissioned Dan Yagmin Jr. to create our characters and illustrate our children’s book. We also developed our outreach materials: single page handouts with cutouts of the characters and instructions on what to do. We loaded everything onto the Shark Defenders website and purchased the url www.sharkstanley.com. French Polynesia announced their shark sanctuary at WCPFC in December 2012. 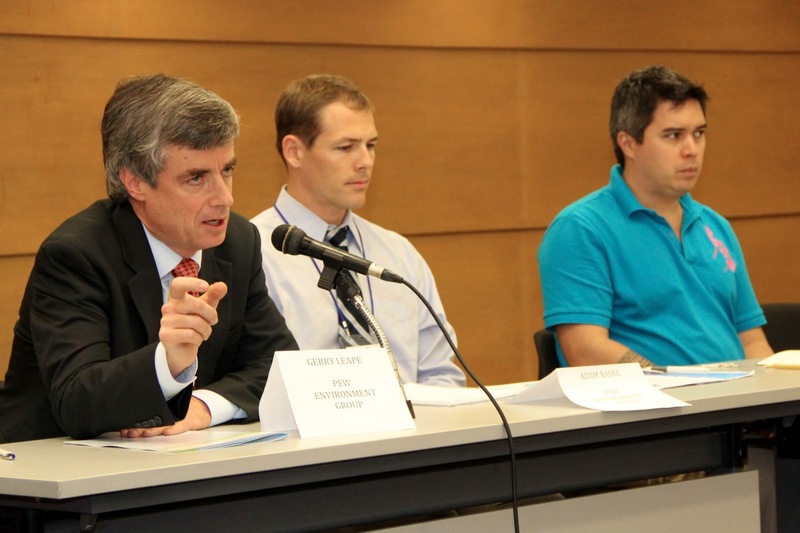 The campaign launched a month later on December 17. 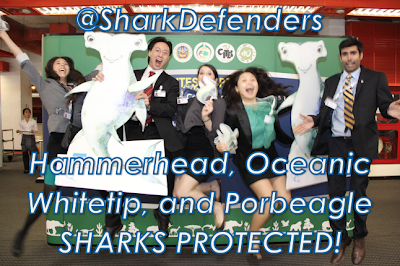 It was a busy time for those of us working on shark conservation because of the Cook Islands and French Polynesia shark sanctuary declarations and work on sharks at the Western Central Pacific Fisheries Commission. 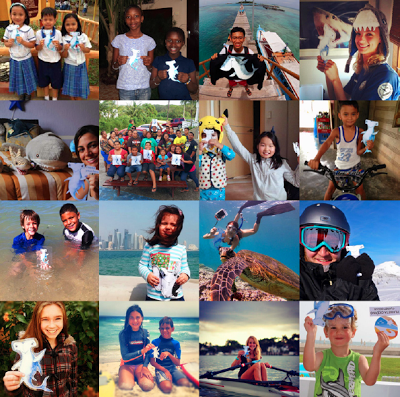 Regardless, we launched on Shark Defenders and our partner websites by asking young people (and the young at heart) to photograph themselves holding cutouts of a paper shark named Shark Stanley. Shark Stanley represented the proposal to list scalloped, great, and smooth hammerheads on CITES Appendix II. A photo with Shark Stanley represented a signature to support the proposal. We promised characters representing the other proposals and a children’s book over the coming weeks. Leah and Onon also started a fundraising campaign on Indiegogo. 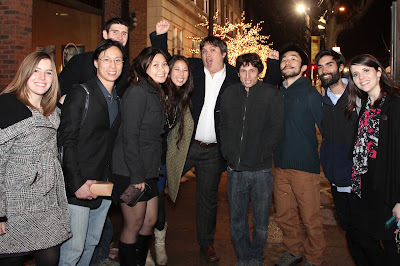 As part of their study at Yale they were tasked with hosting a symposium. This required money. There were also printing and design costs associated with the children’s book and the photo petition and these needed to be covered. Manta Reina was released on New Year’s Eve, followed by Pierre le Porbeagle on January 4, and Waqi Whitetip on January 9. The response to Shark Stanley and his friends was immediate. In the first three days we received photos from the United States, Canada, Mongolia, Northern Mariana Islands, Palau, Philippines, New Zealand, Australia, South Africa, Taiwan POC, South Korea, Germany, and Singapore. We reached 50 countries by the middle of January. Photos poured in from all corners of the globe and we added a new partner organization nearly every day, including Shark Savers, Coral Reef Alliance, Hong Kong Shark Foundation, Taiwan SPCA, Earth Race Conservation, and many other NGOs and dive shops. The Adventures of Shark Stanley and Friends was released on January 30. It was (and still is) available as a free download on Shark Defenders and Yale’s Sage Magazine. Leah and her classmate Ben Goldfarb wrote the text. Dan Yagmin Jr. illustrated and Monte Kawahara designed the 32-page book. The story contained in the pages explains the threats sharks and manta rays face from a global trade in their parts. And it rhymes. The Shark Stanley team at Yale (from left to right): Stephanie Stefanski, Jeff Chow, Ben Goldfarb, Onon Bayasgalan, Leah Meth, Angelo Villagomez, Dan Yagmin Jr., Monte Kawahara, Omar Malik, and Laura Johnson. Leah and Onon hosted their symposium “From Ocean to Plate – An Interdisciplinary Symposium on the International Trade and Conservation of Sharks and Marine Species” on February 15. Dr. Barbara Block, Dr. Paul Anderson, Dr. Demian Chapman, and Dr. Susan Lieberman spoke on the biology and conservation of sharks during the morning session. In the afternoon, David Doubilet, James Prosek, Krishna Thompson, and Barton Seaver spoke of the human connection to sharks and the ocean. Angelo was the moderator. Afterwards we all went out for vegetarian sushi. Leah and Onon’s classmate Omar Malik filmed the talks and has uploaded four of them to Shark Defenders Youtube Channel. 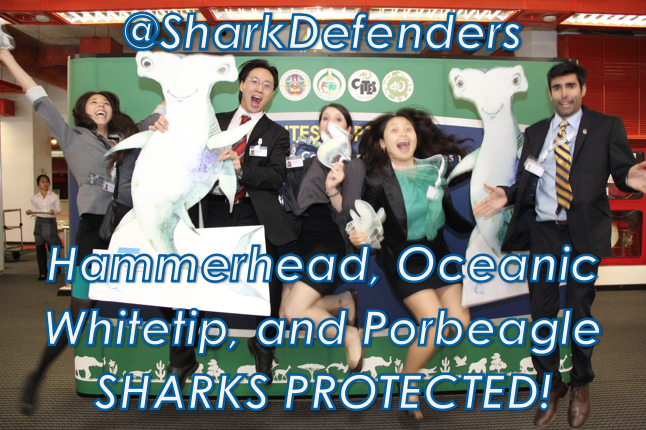 Throughout the campaign updates were posted to Shark Defenders blog, Facebook, and Twitter. We also started a Facebook page specifically for Shark Stanley. Using Shark Defenders model of purchasing Facebook ads, Leah was able to increase the number of likes to over 5,000 in two months with only $20. 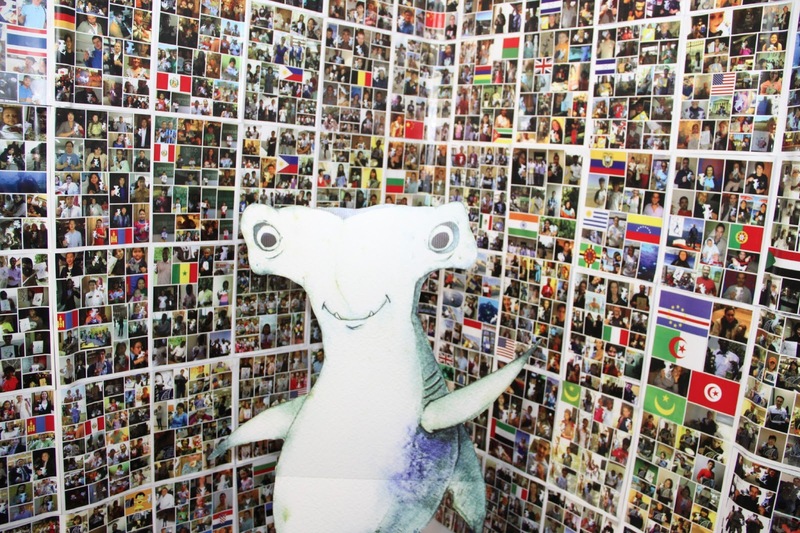 By the end of February Shark Stanley had been to over 120 countries, met thousands of supporters, and had campaign materials translated into 17 languages. 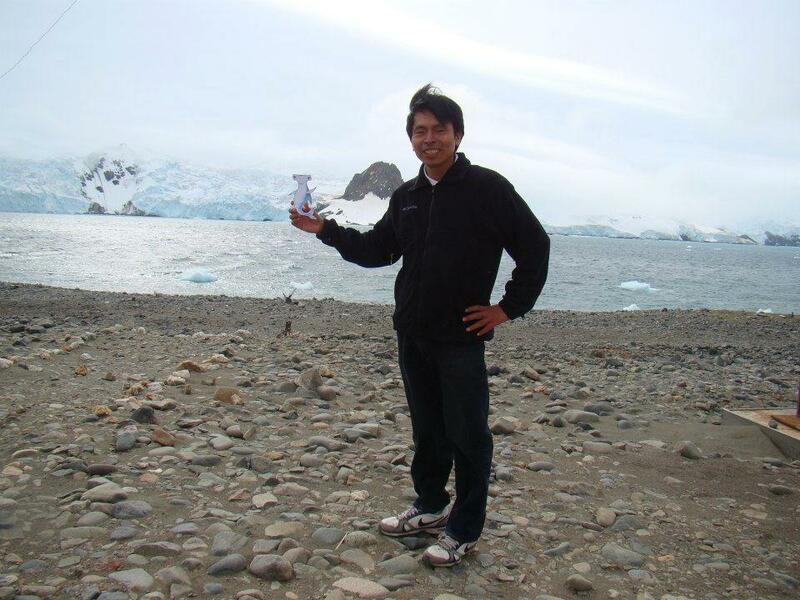 During this time Shark Stanley visited the top of Mount Kilimanjaro, the deserts of Morocco, the islands along the Mariana Trench, the glaciers of Antarctica, and went diving in the Indian, Pacific, and Atlantic Oceans. During this phase of the campaign Leah and Onon spent about four hours per day downloading and sorting the hundreds of photos received each day. 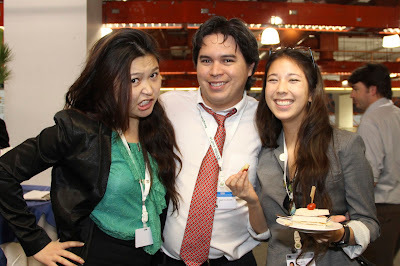 As many photos as possible were uploaded to Facebook. 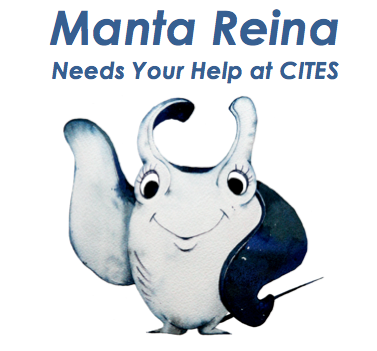 The next phase of the campaign involved preparation for the CITES CoP. Leah and Onon created a 150+ page collage of all the photos we had received prior to February 25 (apologies to everyone who sent in photos after the deadline). We brought 9 copies of the petition to CITES. Seven were in binders to show to delegates, one was used to decorate the booth, and one was used to hand out individual pages to their respective delegates. We printed 1000 Shark Stanley stickers, designed and bought 200 lapel pins, and ordered 2 life size standups. 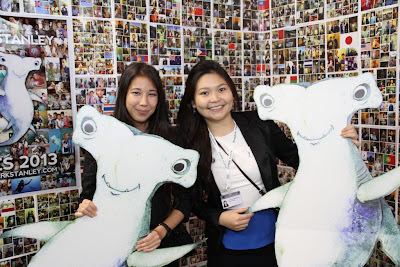 Once we arrived in Bangkok our singular goal was to talk to every single country delegate and turn over the photos from their respective country, something that turned out to be easy since so many people were attracted to our booth by the floor to ceiling photo petition. The Shark Stanley booth was right next to the Pew Charitable Trusts booth, so after we finished telling delegates that the youth of the world and the youth of their respective countries supported the shark and manta ray proposals, Pew would show them how to easily identify shark species by their dorsal fins, and vice versa. A majority of the delegates were supportive and enjoyed looking for their flags on our wall. We continued to give live updates on Facebook and the blog and whenever sharks were discussed in Committee I or Plenary, we live-tweeted the discussion. We worked as a team to tweet. Leah posted verbatim what the delegates were saying on the floor, while Angelo posted commentary and tried to put the discussions in context. 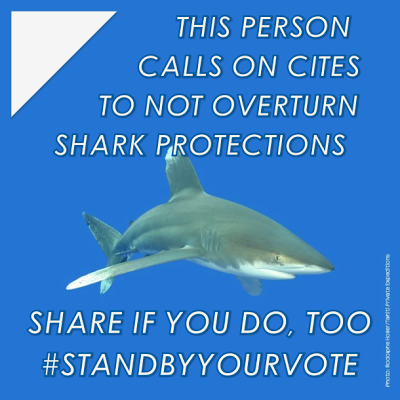 After the sharks passed in Committee I, we worked with Shawn Heinrichs, Mary O’Malley, and Paul Hilton to create #StandByYourVote to pressure delegates to keep the vote from being reopened in Plenary. We made it easy for people from around the world to email their respective delegates in Bangkok and demand that they not reopen the vote. Japan and China were expected to try to reopen and overturn the vote, something they successfully did to porbeagles in 2010. 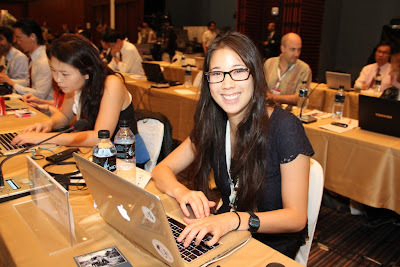 There was some grumbling from the other NGOs, but governments were put on notice that the world was watching them. The first Shark Stanley campaign ended on March 14, 2013 with the successful listings of manta rays, hammerheads, porbeagles, and oceanic whitetips on CITES Appendix II. There are no concrete plans for a second campaign, but we are exploring our options.